Carson-Dellosa Publishing 110215 - Features numbers ranging from -20 to 120 Includes 14 number strips. Supports Common core State Standards. This number line bulletin board sets supports Common core State Standards with 14 number line strips with numbers ranging from -20 to 120 . Teacher Created Resources OS EP63156 - Teachers can decorate and educate with these economical learning tools! package of 36 photographic accents with 36 different designs. 36 accents per pack. Supports Common core State Standards. Approximately 6 x 8". Features numbers ranging from -20 to 120 Durable card stock. Includes 14 number strips. Approximately 6 x 8". Carson Dellosa Publishing company, Incorporated 5604 - One hundred 2" wide clear acrylic pockets in flame-retardant nylon chart with grommets for hanging. Supports Common core State Standards. One hundred 2" wide clear acrylic pockets in flame-retardant nylon chart with grommets for hanging. One hundred 2" wide clear acrylic pockets in flame-retardant nylon chart with grommets for hanging. Carson-Dellosa Publishing CD-5604 Hundreds Pocket Chart with 100 Number Cards - 36 accents per pack. Includes 14 number strips. Learning Resources, Inc LER2418 - Features numbers ranging from -20 to 120 . Includes pre-printed, tomorrow, months, holidays and celebrations, double-sided cards for dates, years, yesterday, days of the week, today, weather conditions and seasonsmdash;136 heavy-duty cards in all! Supports Common core State Standards. Approximately 6 x 8". 36 accents per pack. Product descriptionThis sturdy, vinyl pocket chart will makes a visually appealing introduction to weather. Great for ages 3+. Durable card stock. One hundred 2" wide clear acrylic pockets in flame-retardant nylon chart with grommets for hanging. One hundred 2" wide clear acrylic pockets in flame-retardant nylon chart with grommets for hanging. Learning Resources Calendar and Weather Pocket Chart - Includes cards labeled 1-100 with multiples of 2, 3, 5 and 10 highlighted in different colors. Approx 26w x 26h. Sturdy flame-retardant vinyl chart with hanging grommets measures 3075"l x 44. 25"h. Includes 14 number strips. Features 136 double-sided, full-color cards. Engage children in learning about seasonal happenings and weather with this illustrated chart! Teacher Created Resources OS 4482 - Shiny protective coating for durability. 12 pieces total. Each piece measures 5" x 18". Durable card stock. Includes 14 number strips. Engage children in learning about seasonal happenings and weather with this illustrated chart! Hundreds pocket chart. Headliners add instant appeal to any classroom! Use them as titles for bulletin board displays. Approximately 6 x 8". Great for ages 3+. Supports Common core State Standards. 36 accents per pack. One hundred 2" wide clear acrylic pockets in flame-retardant nylon chart with grommets for hanging. One hundred 2" wide clear acrylic pockets in flame-retardant nylon chart with grommets for hanging. Includes cards labeled 1-100 with multiples of 2, 3, 5 and 10 highlighted in different colors. Teacher Created Resources Colors Headliners 4482 - Approx 26w x 26h. Features numbers ranging from -20 to 120 Features 136 double-sided, full-color cards. Line them up along a wall, above a chalkboard, or use them to create classroom centers. Sturdy flame-retardant vinyl chart with hanging grommets measures 3075"l x 44. Scholastic TF5105 - One hundred 2" wide clear acrylic pockets in flame-retardant nylon chart with grommets for hanging. One hundred 2" wide clear acrylic pockets in flame-retardant nylon chart with grommets for hanging. Includes cards labeled 1-100 with multiples of 2, 3, 5 and 10 highlighted in different colors. Approx 26w x 26h. Durable card stock. Pocket chart features a storage pocket for cards and straws. Supports Common core State Standards. Sturdy flame-retardant vinyl chart with hanging grommets measures 3075"l x 44. 25"h. Shiny protective coating for durability. 12 pieces total. Includes 14 number strips. Great for ages 3+. Two-color cards include 3 place-value cards, 30 number cards, and 1 title card. Counting Caddie and Place Value Pocket Chart - Hundreds pocket chart. 36 accents per pack. Features numbers ranging from -20 to 120 Plastic dowel rod stitched inside each pocket chart for stability. Scholastic TF8060 - Approximately 6 x 8". Engage children in learning about seasonal happenings and weather with this illustrated chart! Each piece measures 5" x 18". One hundred 2" wide clear acrylic pockets in flame-retardant nylon chart with grommets for hanging. One hundred 2" wide clear acrylic pockets in flame-retardant nylon chart with grommets for hanging. Includes cards labeled 1-100 with multiples of 2, 3, 5 and 10 highlighted in different colors. Approx 26w x 26h. 1 number line 0-100, 16 feet long. Plastic dowel rod stitched inside each pocket chart for stability. 12 pieces total. 36 accents per pack. Teach counting! Realistic photographs in full color. Great for ages 3+. Scholastic Teacher's Friend Numbers 0–100! Mini Bulletin Board TF8060 - Shiny protective coating for durability. Sturdy flame-retardant vinyl chart with hanging grommets measures 3075"l x 44. 25"h. Durable card stock. Scholastic TF5101 - Plastic-coated to resist fading and increase durability! Reinforced grommets. Approximately 6 x 8". Plastic dowel rod stitched inside each pocket chart for stability. Full-color photo cards include 12 month cards, 33 date cards, 7 week days, 4 birthdays, 2 field trips, and 2 special days. Engage children in learning about seasonal happenings and weather with this illustrated chart! Monthly Calendar Pocket Chart - 75"l x 44. 25"h. Reinforced grommets. Durable card stock. Realistic photographs in full color. ETA hand2mind 4924 - Plastic dowel rod stitched inside each pocket chart for stability. Engage children in learning about seasonal happenings and weather with this illustrated chart! Durable card stock. Reinforced grommets. The number line is made up of 12 individual sections when combined forms a number line from -20 to 100 . 1 number line 0-100, 16 feet long. Sturdy flame-retardant vinyl chart with hanging grommets measures 3075"l x 44. 25"h. Teachers in pre-k, and secondary classrooms use educational kits, products, literacy, elementary, and manipulatives alongside math, science, and STEM curriculum to demonstrate concepts and real-world applications through hands-on activities. hand2mind Number Line -20 to 100, For Classroom Wall, Bulletin Board & Math Classes, 4" x 36' - Each section is 4” x 36”. Educational products, manipulatives, and kits incorporate applied math and science principles into classroom and homeschool-based projects. Includes 14 number strips. Also includes a 2-page activity guide. Hundreds pocket chart. 36 accents per pack. Realistic photographs in full color. Christie Solutions LLC - Number line covers the numbers -20 to 100 and consists of 12 individual sections. Teach counting! Use shapes chart for classroom or Homeschool bulletin board. Large enough to see from across the classroom. Hundreds pocket chart. Approximately 6 x 8". Also perfect for any wall. Plastic dowel rod stitched inside each pocket chart for stability. Visually demonstrate basic concepts in counting. Realistic photographs in full color. A great chart with ten shapes to teach toddlers and kids as they enjoy easy learning. Includes 14 number strips. Reinforced grommets. Features numbers ranging from -20 to 12017x22 inches with bright, bold and attractive lettering and beautiful pictures. SHAPES Chart by School Smarts ● Fully Laminated, Durable Material Rolled and SEALED in Plastic Poster Sleeve for Protection. Discounts are in the special offers section of the page. - Simple for children to understand and follow. Durable card stock. 60 pieces 25" x 27 3/4". Each individual section is 4" x 36". Easy to hang up on the wall. Plastic dowel rod stitched inside each pocket chart for stability. Colors Chart by School Smarts 12 BOLD Colors ●Fully Laminated Durable Material Rolled for Protection and SEALED in a PROTECTIVE poster sleeve. Discounts are in the special offers section of the page. Numbers 1-10 Chart by School Smarts for Babies and Toddlers Fully Laminated Durable Material Rolled and SEALED in a Plastic Poster Sleeve for Protection. Discounts are in special offers section below. 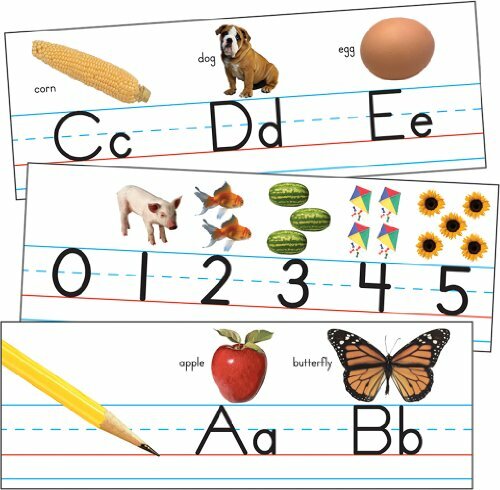 School Smarts ABC Alphabet Poster Fully Laminated ,Durable Material, Rolled and SEALED in Plastic Poster Sleeve for Protection. Discounts are in the special offers section of the page. Months of the Year Chart by School Smarts Fully Laminated Durable Material Rolled and SEALED in Plastic Poster Sleeve for Protection. Discounts are in the special offers section of the page.